Jon England wants your CANS, for C.A.M.! Following on the heels of an extraordinarily successful opening week at the Caravelle Theatre, Jon England’s “Royally Entertained” music show has been quick to capitalize on the ‘buzz’ surrounding his new-found home’s readiness to assist those in need. who continue the never-ending battle to feed all the mouths in Branson’s surrounding counties. From Tuesday the 29th July to Saturday 2nd of August at 2 pm; all comers from Taney, Stone, Green and Christian counties (in MO) and Boone and Carroll counties (in AR) are invited to bring 2 cans of fruit and $5 to watch what folk are calling “London’s Liberace” tear up the three (yes, 3!) 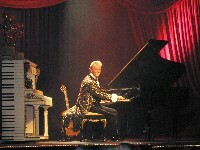 pianos on stage in his fabulous new 2-hour entertainment offering plus effortless artistry on two guitars, song and dance! Did we mention the gorgeously featured stage set reminiscent of Hollywood’s “Golden Era” and an Internationally-flavored English mini-travel-culture-documentary in the half hour before show time? And a ‘Royal’ guest whose mere presence will flabber-your-gast? Well – we have now. No two shows are ever the same as Jon not only arpeggiates and dazzles through over an hour of internationally known million-selling hits, but makes the shows’ second half a custom-made, personalized experience for every audience member with a musical favorite in their heart. Rarely stumped for a title, Jon plays Ragtime and Classical must-haves alongside Tin-Pan-Alley sing-a-longs from Al Jolson to Fats Waller, and just about everything in between on sumptuously created pianos that resemble exotic wedding cakes, as much as musical instruments! Don’t miss it – and know in your heart you’re helping your neighbors with real, solid loving assistance. 3446 W. Hwy 76 (next to Jim Stafford’s and across from Mickey Gilley’s) is the place to be; Tuesday 29th July to Saturday 2nd August at 2 p.m. $5 + 2 cans of fruit is the bargain price for an afternoon of unforgettable musical fun.